Nothing beats the smell of freshly baked bread. Especially when you’re pregnant and craving carbs like crazy. Bread is one of those real comfort foods that goes with pretty much anything, at any time of day. I will admit that I am a bit of a bread snob, and my favourites are always the crusty and wholesome breads. But let’s be honest, who actually has the time to bake bread? Well, with this recipe, you will. Because it takes all of about 10 minutes. Max. (excluding baking and fermentation time that is). But first, let’s talk about why you should take 10 minutes out of your day to make your own bread. Unfortunately a lot of the supermarket breads are not very nutritious. Sliced bread, even if it is brown (which can sometimes just be dyed brown! not actually be wholemeal-brown), often has extra yeast, sugar and added chemicals to make the dough rise quicker, allowing for little or no fermentation time. Fermentation is normally required to allow for air pockets to develop making the bread light and fluffy. 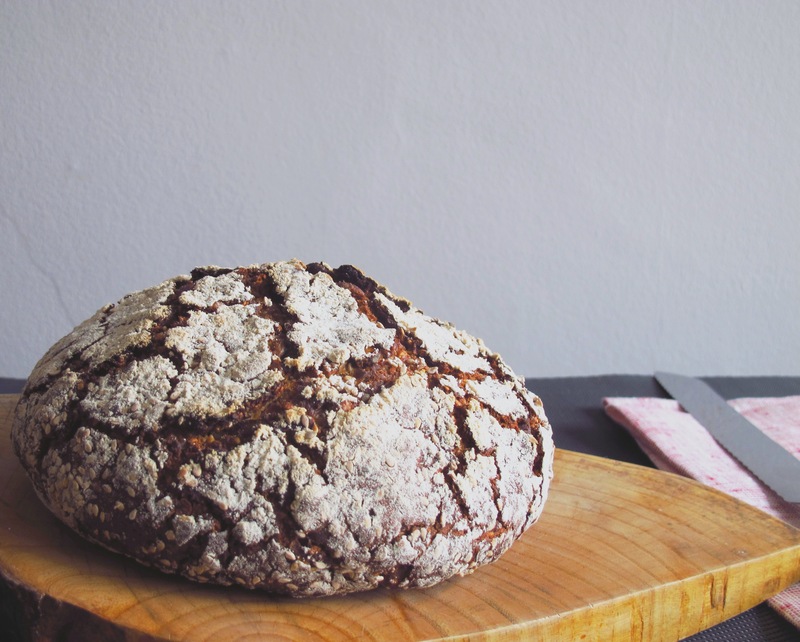 White bread has been stripped off of all its main nutrients in the process of making white flour, taking out the fibre, vitamins and minerals. It means that the carbohydrates are converted into sugar very quickly, giving you a sugar high. This causes your body to over-produce insulin to deal with all the sugar, which will then cause your blood sugar to drop sharply. As this process happens over and over again, your body’s ability to produce and use insulin becomes less efficient, and eventually may lead to type 2 diabetes (or gestational diabetes too!). You may be able to find nutritious, wholemeal bread in certain stores, especially health food shops. However, you might have to pay an arm and a leg for a loaf (compared to supermarket sliced bread). But it is a good alternative for when you can’t spare 10 minutes, or haven’t had the chance to plan ahead. 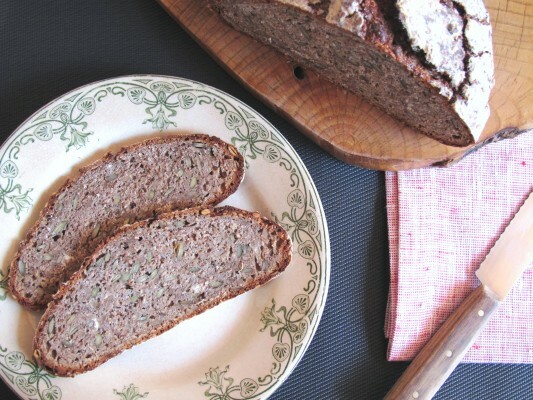 This recipe is based on the no knead bread the New York Times published, by Jim Lahey. It is a great recipe because the bread requires no kneading whatsoever. Perfect. But of course I had to adapt it to make it healthier and more nutritious. I’ve changed the flour to wholemeal spelt, which is wheat free, so great for those of you who feel bloated after eating wheat. I’ve also added lots of seeds which are rich in protein and nutrients, allowing your blood sugar to rise slowly instead of sharply as with white flour. This is a dense, heavy bread though, so may take a little getting used to if you’re normally one to eat white sliced bread. The star of the bread here are the sesame seeds. Sesame seeds might be small, but they are so full of calcium that a quarter of a cup contains more than a whole cup of milk. Being pregnant means that your calcium requirements almost double. However your body is much better at absorbing calcium when you’re pregnant, so it doesn’t mean that you need to actually eat double the amount of calcium containing foods. Make sure to buy unhulled sesame seeds rather than the hulled version, as the latter contain a lot less calcium. On a final note, be careful not to burn yourself when making this bread! The oven needs to be very hot so use a pyrex or cast iron pot that has a lid, and that is oven safe. Remember to pre-heat the pot beforehand too. You may want to watch the New York times video to get an idea of the process. Mix all the dry ingredients together, followed by the water. It should be relatively sticky, and not really kneadeable. Cover lightly with cling film & a tea towel, and leave in a warm dark place for 12-24hours. When you’re ready to bake, pre-heat your oven and your pyrex or cast iron pot (with the lid) to 250C. Then place your dough on a clean, floured surface, and fold the 4 sides into the centre of the dough, and quickly but carefully drop your dough into the heated pot. Cover and bake for 35 minutes with the lid on, and 15 minutes with the lid off. Allow to cool before slicing. The bread will keep in room temperature for 5-6 days or so, but if you know you won’t eat it in that time, slice and freeze to enjoy at a later date. Now that I’ve tried it I can say it is yummy. Next time I will make 1 1/2 recipe to fill my larger pot. My loaf came out a bit flat. Looks delicious. Great project for a snowy weekend. Your website is beautiful too. Congratulations!